SOUTH BEND, Ind. 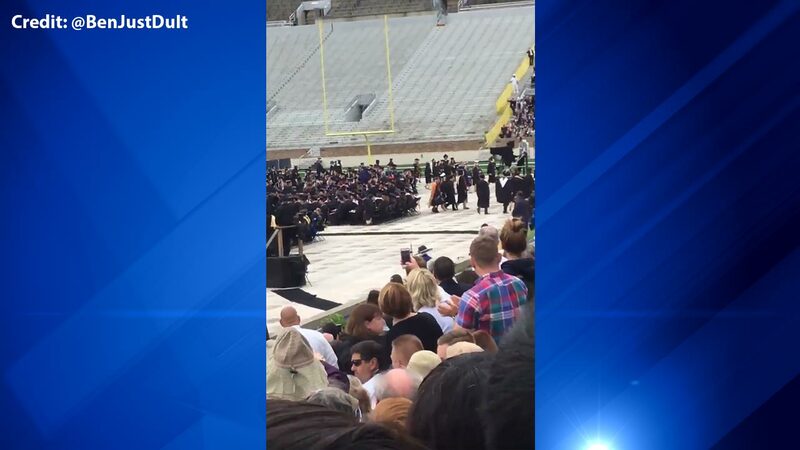 -- Dozens of graduates and family members silently stood and walked out Sunday as Vice President Mike Pence began his address at Notre Dame's commencement ceremony. Pence, the former governor of Indiana, was invited to speak after Notre Dame students and faculty protested the prospect of President Donald Trump being invited to become the seventh U.S. president to give the commencement address. Pence spoke briefly of Trump, praising his speech to the leaders of 50 Arab and Muslim nations earlier in the day in Saudi Arabia. Pence said the president "spoke out against religious persecution of all people of all faiths and on the world stage he condemned, in his words, the murder of innocent Muslims, the oppression of women, the persecution of Jews and the slaughter of Christians." Trump has faced harsh criticism for his anti-Islamic rhetoric during the campaign, as well as his administration's legal battle to impose a travel ban on several Muslim-majority countries. Earlier in the ceremony, valedictorian Caleb Joshua Pine urged a "stand against the scapegoating of Muslims" and criticized Trump's push to build a wall along the Mexican border. Cassandra Dimaro and her parents were among those who walked out. Dimaro told the South Bend Tribune that it was a show of solidarity "for those of us impacted by the policies of the Trump administration." Pence didn't comment on the walkout, which was expected, but he did allude to clashes at campuses elsewhere that have derailed appearances by controversial speakers, such as conservative firebrand Ann Coulter at the University of California at Berkeley. "This university (Notre Dame) is a vanguard of the freedom of expression and the free exchange of ideas at a time, sadly, when free speech and civility are waning on campuses across America," he said.